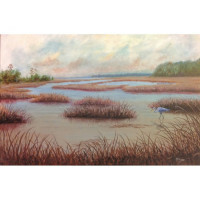 Acrylic Paintings for sale direct from South Carolina artists. Another miniature we love. The detail and color are amazing. These are great on a desk, mantel or table. 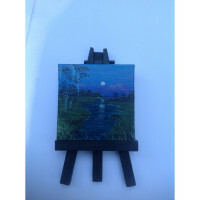 Each one is painted around the edges, comes with an easel and is signed on the back. Here's a chance to have an origin.. This is an original and the photo does not compare to holding this in your hand or displaying on a table, desk or mantle. These miniatures are full of detail and color and almost appear as a 6x12. These are very popular as gifts. W.. Photos cannot show the beauty of this one. I attached different photos because camera lighting can't seem to show it's colors right. Nevertheless, we love it and are making prints of it. 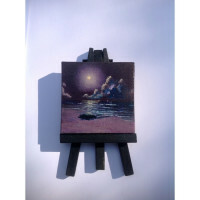 We don't sell our originals but we approve..
Another miniature that looks so much better in person than a photo can give. The colors and detail are amazing. 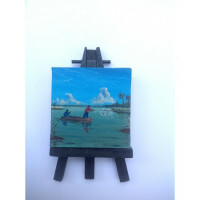 Each one is painted around the edges, comes with an easel for displaying and is signed on the sides and back. Thes.. These are great as gifts but you may find yourself wanting to keep each one like we do. These are great for the mantle, desk or table. These do not compare to seeing them in person. The detail and color are amazing. We don'.. I like to paint portraits on new paint cans. Why not? 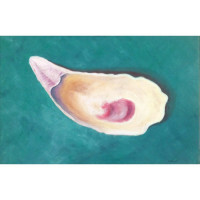 I paint portraits of people, pets, cars, and old home-places. Paint cans come with a lid (and treats if you request them)!! 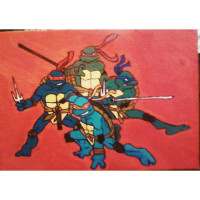 I use acrylic paint and put an outer coating of acrylic polymer t.. Absolutely one of my favorites. The color and detail in this is amazing. It's painted around the edges, comes with an easel and is signed. Will be great as a gift but you may find yourself wanting to keep this one for yourself.&n.. These miniatures are great for gifts but if you're like us, you'll want to keep them all for yourselves. These are great for the mantle, desk or table. 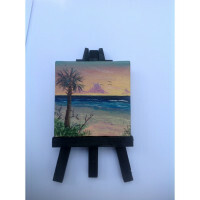 The edges are painted and it comes with an easel for displaying. The pho.. Photos do not compare to seeing in person. Great color and detail. 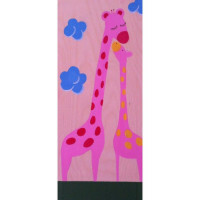 Great for gifts but you may find yourself wanting to keep each one like we do. Each one comes painted around the edges and is signed. Each one comes with an.. This miniature was a hard one to decide to sell or not. We don't sell our larger originals as they are too valuable to our family. The photo doesn't compare to seeing in person. The detail and colors are amazing. Each one i..
Another great miniature. Photos do not compare to seeing in person. Great color and detail. 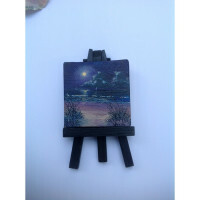 Each one is hand painted around the edges and comes with an easel for displaying. Each one is signed and titled. Great for.. This is a giclee print from a 24 x 36 original. Different sizes are available. Printed on 100% premium canvas and edge wrapped for display without a frame. ..
Another great miniature. These are great for the desk, mantle or table. The color and detail are amazing. 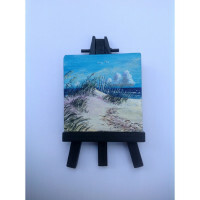 Each one is painted around the edges, comes with an easel for displaying and is signed. ..
Giclee of a gorgeous 24 x 36 original. 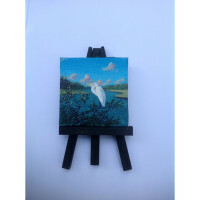 This giclee will come with an extra artist's mark that highlights the white birds roosting on the island and adds value since we do not sell any of our originals (they are too priceless to our family).&.. 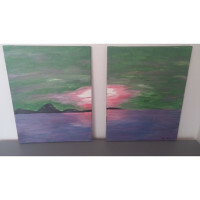 This is an acrylic painting on double canvas, both canvases are 11x14 inches. .. These are great for the desk, mantle or table. 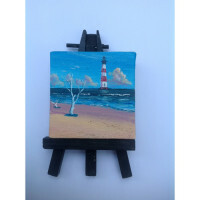 Each one is painted around the edges, comes with an easel and comes signed. Photos don't compare to seeing in person. ..
Another one of our favorites. A beautiful print of the original. 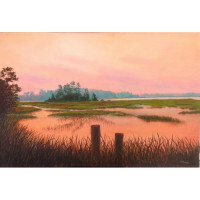 This giclee will come with an extra artist's mark to add value. We do not sell our originals as they are to priceless to our family but we approve every print for its ..
Hello, I am a local fine artist who specializes in portraiture. 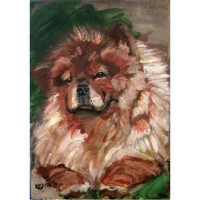 This listing is for a pet portriat acrylic painting on stretched canvas. I work from photographs, either you can supply your own photos or I can meet in Charleston, SC to take.. These are Acrylic paintings inspired by children I worked with as an Americorps member at a Charleston elementary school. Each character and setting was deliberately and specifically chosen by an awesome first grader Endiya requeste..
Against a red sky the egret streches his, rich tones of brown, wings to dry them. .. 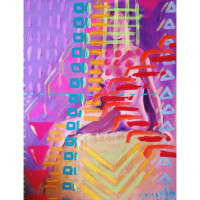 Title:"After the Flame" by Jane Doyle. Original painting inspired by experimental concepts. Acrylic painting Canvas with dark edges. dimensions 16x16x3 .. Original acrylic painting on canvas titled "An Apple a Day" by local Charleston artist, M Alcorn. .. This is an 11"x14" acrylic on paper painting depicting a Covered Bridge in New England in autumn. Being from the New England area I am infatuated with the magic and mystery of the Covered Bridge, and would spend hours visiting them when I wa..
Abstract, geometric lines and shapes covering the female figure. .. These are Acrylic paintings inspired by children I worked with as an Americorps member at a Charleston elementary school. Each character and setting was deliberately and specifically chosen by an awesome first grader. Brandon's favo.. 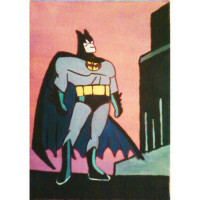 Original Painting "Big Stretch!" by local Artist Laura DeNino (Mama Bear Art) in Charleston, SC. 10x22" Acrylic on Birchwood Wall Art. Mama Bear Art Original Design! .. This piece was inspired by a friend who lost their partner in an accident. The loss she felt was even shared through a note stating the mornings will never be the same. 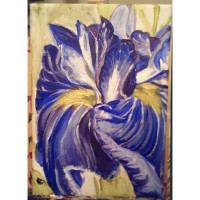 The raw emotions of frustration and loss are intwined with the light of mornin..
"Blue Bearded Iris" 5x7 inch Acrylic on Stretched Canvas. This is an original, one-of-a-kind, painting. No prints are offered. The painting will ship with a hand written note straight from my studio! :) This painting has metallic gold .. 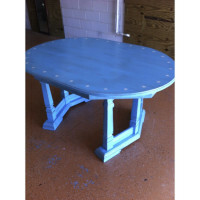 This unique shaped table is painted in turquiose blue with stars and a stain to make it look weathered. Add your choice of chairs for a conversation piece. 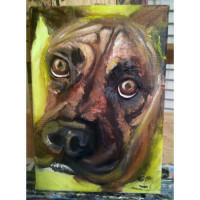 ..
"Boxer" 5x7 inch Acrylic on Stretched Canvas. This is an original, one-of-a-kind, painting. No prints are offered. The painting will ship with a hand written note straight from my studio! :) Frame not included. Please contact me, t..
A painting of a little boy holding apples. I love the adding of a small portion color to black and white paintings. 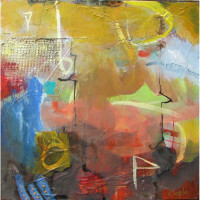 ..
"Bright Abstract 1" acrylic painting on canvas by Lauren Neville, Charleston, SC. Dimensions are: 24" x 36". 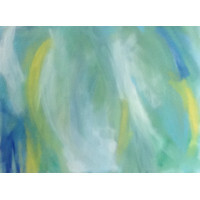 ..
"Bright Abstract 2" acrylic painting on canvas by Lauren Neville, Charleston, SC. Dimensions are: 24" x 36". 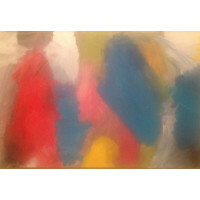 ..
Four seperate canvasses with abstract, layered, acrylic paint. .. 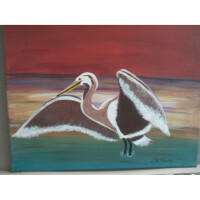 This painting is acrylic on canvas, 18X24, framed with a dark brown wooden frame and ready to hang. 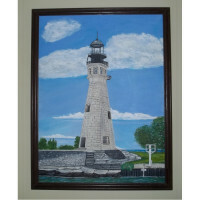 The Buffalo Lighthouse was established and lit in 1833 and was deactivated in 1914. This 60-foot-tall octagonal limestone structure is the oldest s.. Original Painting "Carry Me Mama!!" by local Artist Laura DeNino (Mama Bear Art) in Charleston, SC. 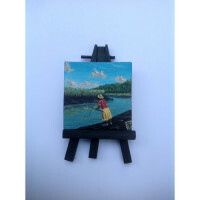 8x8" Acrylic on Birchwood Wall Art. Mama Bear Art Original Design! .. 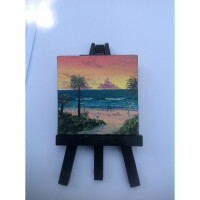 This painting was created using acrylic paint on a skim board. The board was treated with a protective glazing for durability and UV fade resistance. Size is 40 inches by 20 inches. 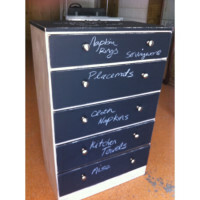 ..
5 drawer wood dresser has cream shabby chic sides with black chalkboard fronts so you can label what is in each drawer. .. 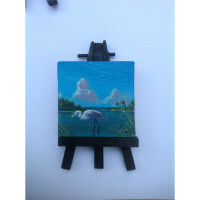 Original Painting "Charleston Beach Birds" by local Artist Laura DeNino (Mama Bear Art) in Charleston, SC 8x8" Acrylic on Birchwood Wall Art. Original Mama Bear Art design .. 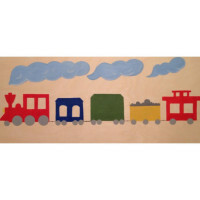 Original Painting "Charleston Choo Choo" by local Artist Laura DeNino (Mama Bear Art) in Charleston, SC 10x22" Acrylic on Birchwood Wall Art. Mama Bear Art Original Design! 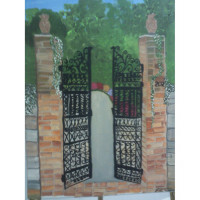 ..
there are many beautiful gates in Charleston ... this is one ..
Set of three (3) original acrylic paintings on canvas titled "Charleston Treasures" by local Charleston artist M Alcorn. Each measures 3" x 5". ..
"China Breeze" by Jane Doyle Painted with acrylic. Wood on panel with natural colored edges. Original painting inspired by experimental concepts. 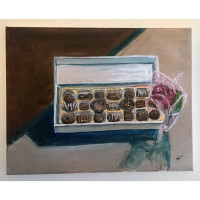 Dimensions 16x16x2 ..
"Chocolate Box" 11x14 inch Acrylic on Panel. This is an original, one-of-a-kind, painting. No prints are offered. The painting will ship with a hand written note straight from my studio! 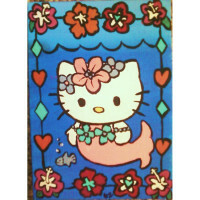 :) Please contact me, the artist, with any questio..
"Chow" 5x7 inch Acrylic on Stretched Canvas. 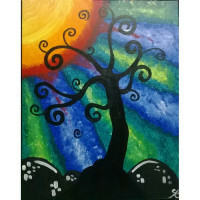 This is an original, one-of-a-kind, painting. No prints are offered. The painting will ship with a hand written note straight from my studio! :) Frame not included. 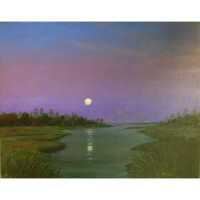 Please contact me, th..
"Cool and Calm" acrylic painting on canvas by Lauren Neville, Charleston, SC. 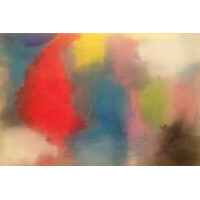 Dimensions are: 30" x 40". .. These are Acrylic paintings inspired by children I worked with as an Americorps member at a Charleston elementary school. Each character and setting was deliberately and specifically chosen by an awesome first grader. Deverell asked..
16"x20" Acrylic Painting on canvas. Can reproduce this painting and paint it in alternate colors upon request. ..